My shoot with Laurence was held in mid June on a drizzly day which kept us mostly inside my studio. Typically my clients rely on me to help them feel relaxed in front of the camera. But in this case, it was Laurence who put me at ease with his warm, easy-going manner. He is also quick with an endearing joke about his thinning hair, recent challenges with short-term memory loss, and how he likes to antagonize his mother. Last June, I photographed Laurence Carolin for Make-A-Wish. Based in Ann Arbor, the Make-A-Wish Foundation of Michigan grants the wishes of children throughout Michigan facing life-threatening medical conditions. The goal is to affirm the human experience with hope, strength, and joy. Laurence is one of the most friendly, generous, and inspirational people I’ve ever met. In many ways he’s your typical teenager: he loves soccer, music, the band U2, and cooking. But, in at least one other way, he’s rather extraordinary: Laurence is committed to spreading awareness of, and working to end, extreme poverty in Africa. He has certainly made the issue come alive for me. Two years ago, Laurence was diagnosed with a malignant, inoperable brain tumor. He resolved to make the very best of his difficult situation. When Make-A-Wish offered him a wish, he initially asked to meet Bono. Laurence credits U2’s music and lyrics with literally keeping him alive during the darkest days of his illness. However, when a meeting with Bono couldn’t be arranged, Laurence wasn’t deterred. In fact, he came up with what he considers a far better wish: realizing that he actually has everything he needs, he wished to give his wish money (the money that would have been spent fulfilling his wish) to the United Nations Foundation to fight extreme poverty and disease in Africa. He credits U2 with inspiring this choice as well. Extreme poverty in Africa was a problem Laurence first learned about from the One Foundation, an organization co-founded by Bono. “She moves in mysterious ways.” This second wish caught Bono’s attention, and now it was Bono who wished to meet Laurence. Ultimately, both of Laurence’s wishes came true: Make-A-Wish donated $5000 to the UN Foundation in Laurence’s honor. And he also got to spend some very precious time (talking, hanging out, praying) with the members of U2 backstage before their recent concert in Chicago. Laurence has become an unforgettable person in my life. And thanks to his work, I have a greater appreciation of the problems plaguing Africa and how I can help combat them. Such as by contributing to the UN Foundation. You can read below, in Laurence’s own words, about how ending extreme poverty became his life’s mission. My name is Laurence James Carolin. I’m a 15-year-old, who lives in Michigan in the U.S. My life story began in South Korea, just south of the DMZ, where I was born in the military town of Dongducheon. 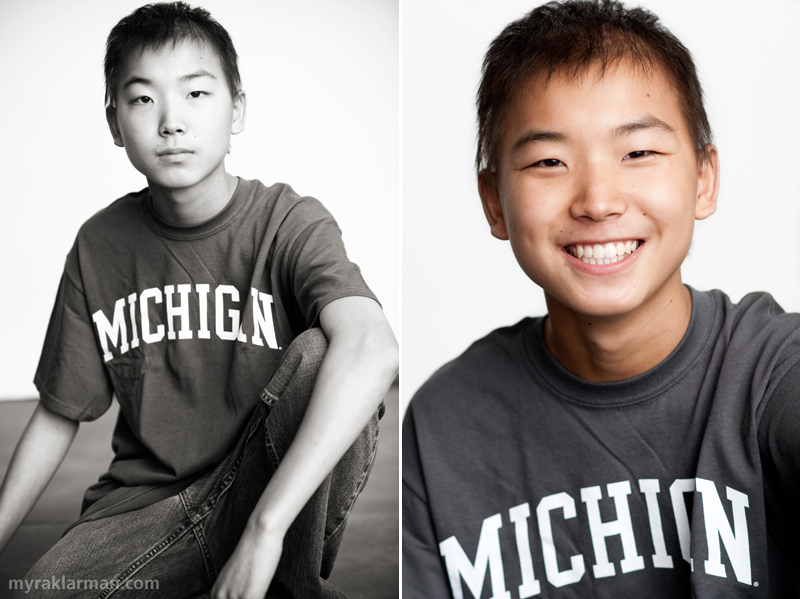 At the age of five months, I was adopted by my parents, Lisa and Patrick Carolin, who lived in Ann Arbor, Michigan. I don’t know what life would have held for me in South Korea, but I had all sorts of opportunities in the U.S. to do an endless number of things with my life. From my excellent medical care to my personally beneficial education, I have had the kind of start that I wish everyone could have. In 2007, my easy life was challenged. I began a troubling road when I started experiencing headaches and fatigue, and then severe depression that made me suicidal, and led to me being placed in a mental institution. After my release, and additional symptoms ensued, including problems with my balance and vision, I received a CAT scan that revealed a huge mass in my brain. On December 27, 2007, I was diagnosed with cancer, soon identified as a glioblastoma multiforme, an inoperable, malignant brain tumor. Since that time I’ve received radiation and chemotherapy, procedures I’m lucky enough to have had the chance to receive living in a country like the U.S.
U2 not only inspired me musically, but inspired me to see the world differently. You let me see the world for what it is, and that is that I live in a country that’s unique and prosperous. Compared to the rest of the world, the U.S. is on a mountain of gold. By opening my eyes to war, poverty and disease around the world, I realized that I was in a position to help make a difference. I felt privileged to be able to take the wish granted me by the Make-A-Wish Foundation, and turn it into a donation to the United Nations Foundation. My goal has been to educate as many people as I can about extreme poverty, and to inspire them to make a difference as well. Some of them have added their own contributions to the United Nations Foundation. Although my ultimate goal—to see extreme poverty end during my lifetime—will not be achieved, my belief is that the mission will continue not only through donation, but through the peoples’ voices to get government on our side. 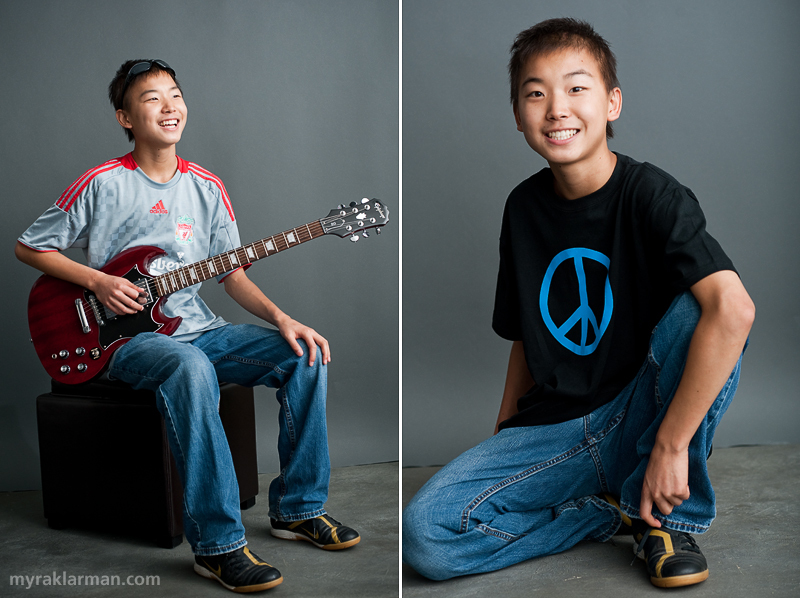 Laurence’s mom, Lisa Carolin, told me that the image on the left is her favorite of all the shots I took of Laurence. 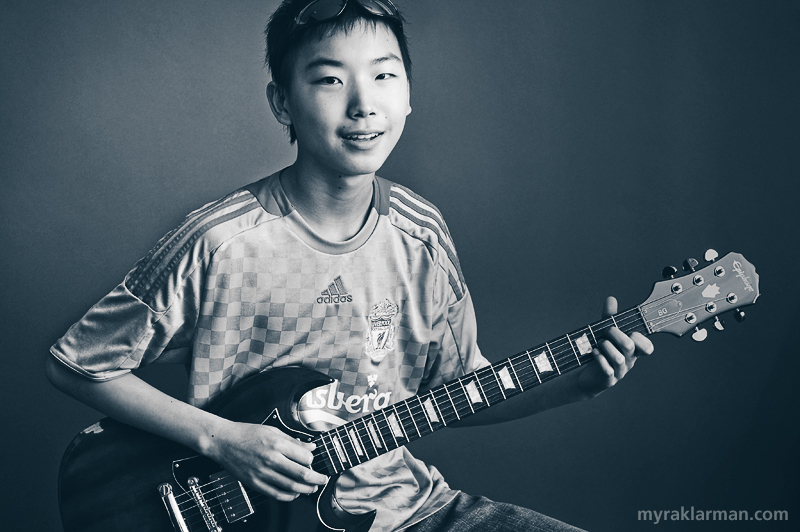 We photographed Laurence with one of his guitars and his favorite soccer jersey for the Liverpool Football Club. Of course we talked about U2, and Laurence re-enacted (accents and all) the voicemail message he had just received from Bono and The Edge. The U2 songs that helped Laurence through his difficult times included One, Where the Streets Have No Name, Beautiful Day, and Walk On. Peace out! Laurence with Make-A-Wish CEO (and Fairy Godmother) Susan Lerch. What a beautiful story, and what gorgeous photographs. Laurence, you are an inspiration to all us hard-hearted adults. Rock on! I am fascinated that you love U2 – one so young. Here’s what I think. Those who spread the message of peace transcend the generations. This is true of U2/Bono. And, this is true of you! I have known Laurence since he was a toddler. He lives 2 doors down from me and has always been older and wiser than his years. Did you take the photos for Faith magazine? They are lovely! Thanks for the comments! And it’s great to hear from you, MK, as someone who has known Laurence since he was so young. I agree, the photos in Faith Magazine are beautiful! They were taken by Chicago-based photographer Jim Luning. You should give a warning to folks before they view this blog entry. It is so moving that it’s almost overwhelming. Laurence is a tremendous inspiration to us all as are you for capturing it so well in pictures and in words. I should have said your pictures are lovely, too, because they are! Myra, great job capturing Laurence and his spirit. As a staff member of the Make-A-Wish Foundation of Michigan I too had the pleasure of meeting Laurence and he certainly has made a lasting impression on me. What an inspirational young man and wish! Your photography, as always, is beautiful! We also posted a blog about Laurence on our site at www.wishmich.org/blog?p=584 and plan to do a follow up soon! Thanks and keep up the good work! Laurence exemplifies the type of child we all wish we had, the kind of person we all wish we were..it is too bad he’s not going to be with us for many many more years. He has done so much in his short life to improve the world, and to touch people’s hearts! I love these photos of Laurence. Knowing him and his family has been an inspiration to me. Sadly, Laurence lost his battle with cancer and is now free of pain and in the arms of our loving Lord. Rock on, Laurence!